Fundamentals of Statistics is the brief version of Statistics: Informed Decisions Using Data. 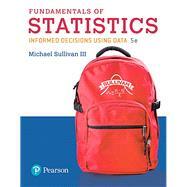 With Fundamentals of Statistics, author and instructor Mike Sullivan III draws on his passion for statistics and teaching to provide the tools needed to see that statistics is connected, not only within individual concepts, but also in the world at large. As a current introductory statistics instructor, Mike Sullivan pulls ideas and strategies used in his classroom into more than 350 new and updated exercises, over 100 new and updated examples, new Retain Your Knowledge problems, and Big Data problems. This practical text takes advantage of the latest statistical software, enabling you to focus on building conceptual understanding rather than memorizing formulas. All resources, including the Student Activity Workbook and Author in the Classroom videos were created for Mike’s classroom to help you succeed and stay engaged. With training in mathematics, statistics, and economics, Mike Sullivan, III has a varied teaching background that includes 15 years of instruction in both high school and college-level mathematics. He is currently a full-time professor of mathematics and statistics at Joliet Junior College. Mike has numerous textbooks in publication in addition to his Introductory Statistics Series, which include a Developmental Math series, and a Precalculus series, which he writes with his father, Michael Sullivan. Mike has built this book in the classroom using feedback from his students. He is well aware of the challenges of students taking an introductory statistics course. His goal is for students to be more informed interpreters of data, so that they will be better decision makers and have stronger critical-thinking skills. When not in the classroom or writing, Michael enjoys spending time with his three children, Michael, Kevin, and Marissa, and playing golf. Making an Informed Decision: How Much Time Do You Spend in a Day...?